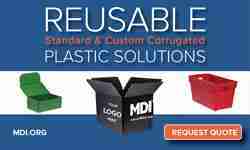 Reusable pallet containment systems, including pallet wraps, bands, straps and nets, can eliminate the cost of shrink wrap and stretch wrap, reduce solid waste, and provide better product protection. If you feel dizzy from the rising cost of stretch wrap, or the awkward ergonomics of hand wrapping stretch film to a pallet load, you are not alone. And Workers Comp claims that can result from all those prone wrapping postures and the use of cutting knives. The good news is that reusable pallet wrappers can reduce or eliminate the need for plastic film. 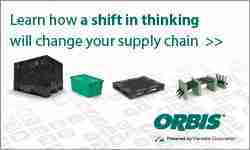 They are perfect for internal or intralogistics applications, as well as for regular shipments as long as the receiving destination cooperates in their return. Avoiding plastic wrap is a good way to reduce environmental footprint. Wrapping the average pallet consumes about 135 linear feet or about a pound of plastic, which is either recycled or sent to the landfill. 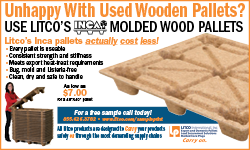 Frank Gallucci of Amici Enterprises, the manufacturer of the Envirowrapper, says that his reusable wrapper helps customers better maximize pallet height while eliminating damage due to loads toppling over. In addition, pallets do not cling together as they do with stretch wrap. Using reusable wrap also translates into a reduction in stretch wrap disposal. Frank reports recent new customer wins domestically as well as in India and Malaysia. We previously reported on the use of reusable wrappers at Premier Organics. Amici, which has been selling the Envirowrapper since 1991, reports many happy repeat customers. P.C. Nets is a new, easy-to-use reusable pallet containment solution. Envirowrapper has been used for many years by a major Canadian grocery retailer, as well as several breweries, mining companies and others. Gallucci is exploring the potential of the Envirowrapper to help make unit loads of more unstable product such as fresh produce compatible with warehouse automation where they currently have load containment concerns. “Pallet Wrapz™ offers a solution to the high cost of stretch film and a reduction in damage to product on the pallets,” offers Matt Jacobs of Pallet Wrapz™, a manufacturer of reusable pallet wrappers. He says that the most popular applications for his company are beverage, document storage and postal. Jacobs is quick to point out additional benefits in terms of waste reduction, as well as with respect to mesh in the wrap which improves air flow through the product. “There is very little if any condensation buildup during the summer months with high humidity that can cause the food product on pallets to spoil,” he says. Both vendors report that their reusable wrappers are quicker and more ergonomically friendly to apply than manual stretch wrapping, while unwrapping does not prevent risk of knife cuts or strains associated with pulling off plastic film. Reusable wrappers incorporate a plastic wrapper in conjunction with belts and Velcro or buckle systems to tighten them around the pallet. They can be customized to fit a range of palletized products from fresh produce to postal/printing, beverage, and frozen foods. Additionally, Amici offers an insulated wrapper for temperature-control products. Display pockets or other features can provide messaging on wrapped unit loads. Another reusable option is the pallet rubber band. 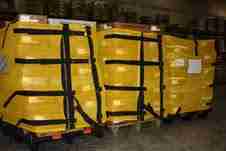 One pallet band or multiple bands can be applied to the load. They can also be used to hold corner boards in position while wrapping a pallet, for example. Read more about pallet bands here. Pallet Wrapz in action. 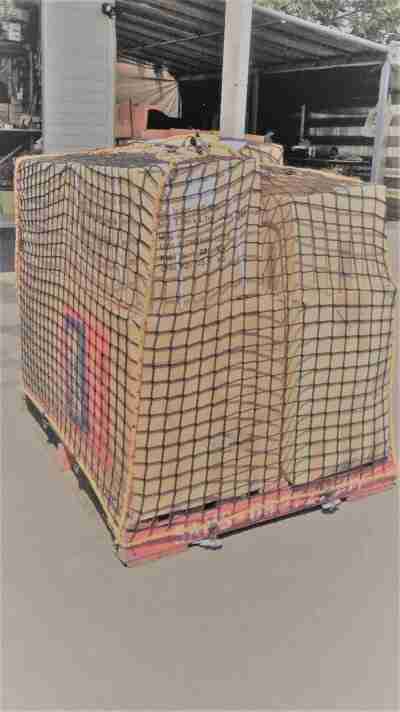 Reusable pallet wraps can be configured for various applications. Determine where wrappers will be stored, to ensure ready access to staff who will be using them. Establish best practices for removing and rolling up wrappers, as well as storage and return procedures. It is important for employees at the receiving destination to know not to cut them off as they would with plastic film. Use a container to accumulate the rolled up wrappers. One grocery retailer uses an empty watermelon bin to gather them for return. Attention to minimizing dwell time and facilitating prompt return will help minimize the amount of wrappers required, as well as help eliminate the possibility of loss. This article appeared in November 2015, updated in 2019. Hi, can I have the contact of those doing this reusable pallet wrap?